Capitalizing on the strength of their first new studio album in 17 years, Chris Difford and Glenn Tilbook, founding members of the British band Squeeze, performed an entertaining career spanning acoustic concert at the Napa City Winery on Wednesday night. Vastly underrated, the songwriting duo of Difford and Tillbrook’s catalog of workand endurance puts them on a short list behind only Lennon and McCartney and very few others amongst the most prolific collaborators of the last half century. Being in the same company with such elite duos such as Elton John and Bernie Taupin, Robert Plant & Jimmy Page, Mick Jagger & Keith Richards, Don Henley & Glenn Frey and Walter Becker & Donald Fagen of Steely Dan is rarified air, even if lots of folks only recognize their music but don’t know them by name. 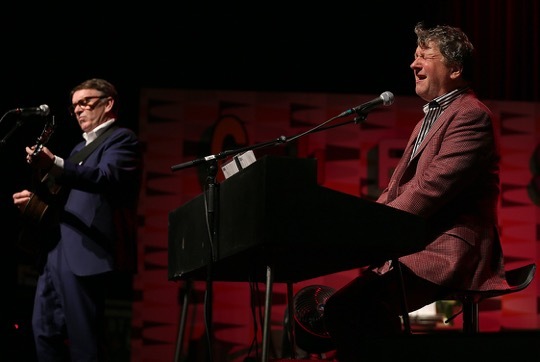 While the band has had numerous line-up changes over the years, the brilliance and witty lyricism of Difford and Tilbrook has produced such well known hits as “Pulling Mussels (From The Shell)”, “Tempted”, and “Annie Get Your Gun”. Each was played during the two hour show that also featured a handful of well received tracks from the newly released “Cradle To The Grave”, a solid and catchy upbeat effort that rocks and presents a number of tunes as good as any the band has produced in the nearly 40 years since their self-titled 1977 debut was released around the start of the new wave movement. Along with featuring choice solo cuts each artist recorded during breaks in their partnership, the show also included an audience participation interlude during each of the two sets where the aptly named Man In The Golden Cape would pass a microphone through the crowd enabling fans to ask the reunited artistsa variety of surprisingly good and informative questions. Squeeze’s “The At Odds Couple Tour,” continues with Friday and Saturday shows at the Great American Music Hall in San Francisco.